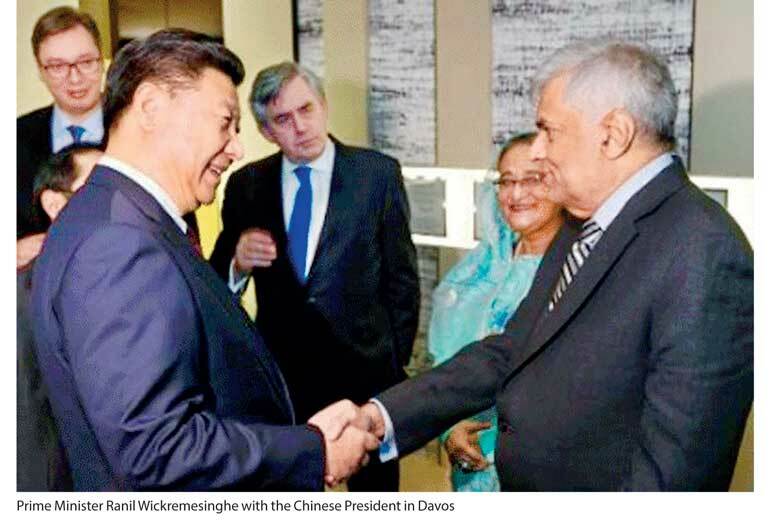 Prime Minister Ranil Wickremesinghe has said many times that Sri Lanka needs a new phase of economic transformation to keep pace with the major changes in global and regional growth. The proposed Colombo Port City project according to the PM is now set to become an international financial outpost in the Indian Ocean, as part of the 20-year framework plan. Wickremesinghe said during a media conference recently that from a real estate project, a decision has been taken to develop the Port City into a financial hub in the Indian Ocean. Despite banks making record profits in 2016 (see chart), the story could be very different post 2017. The high Treasury bill interest rates and the increased AWPLR has facilitated the well-performing banks to gradually increase interest rates and make healthy gains. It is matter of time before the borrowers and the Government will jump into the game to arrest this situation. Therefore, bank margins will come under pressure and with increasing competition with the emergence of a few more new foreign banks. 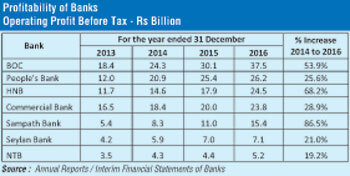 Sri Lankan banks will be under pressure to smart size their operations for tighter performance management, centralised transaction processing, deeper relationships and also grow their fee-based revenue to ensure that they continue to enjoy the double-digit profit growth rates that they have been seeing over the past few years. Another key challenge the banks will face is implementing Basel standards post 2018 while maintaining the attraction of their shares to investors. The new rules in Basel III will negatively affect the numerator as well as the denominator of Return on Equity (ROE) which ratio being the basic and widely-used indicator by equity investors. While the profitability of banks are affected negatively by reduced lending capacity, higher cost of funds, increased cost of liquid assets, the increase in equity base will pull the ROE down. On top of the above the reduction in ROE, banks would be under pressure on their dividend payouts in the future to preserve and build capital buffers. Banks would also need to keep an eye on the potential threat of competition from unrelated industries such as telcos, IT companies, etc., which can put pressure on banks’ margins. The challenge for banks in this area would be to broaden their delivery channels through new technology to cater to Gen Y and Millennials who will quickly opt for social media, tablets and demand for more sophisticated technology to do their banking. With competition intensifying, banks would need to serve their existing customers even better by deepening existing relationships. This would require banks to analyse how their customers use the bank’s products and services, and improve their experience. This analysis also needs to determine what products and services a bank is not offering their customers as these are clearly lost revenue opportunities. Therefore effective cross-sell strategies are critical to improve revenue per customer. To do that banks need to know their customers at a deeper level for cross selling across segments. Finally, the increasing cost of compliance would also be a challenge for banks in general. The banking sector in general is well regulated and the regulators have generally been keeping up with the changes that are taking place globally. However more online monitoring would be far more effective rather than the traditional audits which are generally post event. However, the longstanding conservative supervisory approach with even greater emphasis on prudence underpinned by proactive and forward looking supervisory will continue to work. Changes proposed to the mandatory code and rules also need to be fast-tracked by the Central Bank. The banking sector though well established and stable has ample opportunity to move in to new areas especially in equity financing and long-term lending which obviously has to be backed up by long-term deposits and venturing in to other areas such as investment banking and offering new pension products. A strong capital market with long-term investments and opportunity to hedge risks is what the Government should work towards. Also banks will need new skills and need to invest in the technology that have positive outcomes for customers. Banks will have to identify the future drivers of profitability and modify their business model to remain relevant in the future. All business now is about risk and managing risk – and particular so in banking. Given the existing market conditions one cannot say that the SL banks are totally risk averse. It is not possible to compare with banks operating in different economies. It is safe to say there is no “one size fits all” answer to what kind of business model banks should adopt as a universal rule. It is generally argued that the sector is overcrowded. However some of the smaller banks may find it exceedingly difficult to compete without scale. The capital requirements for the future also may well place demands on the smaller players who would be forced either to go to their shareholders for more capital or find a partner to merge. There is no debate the country needs bigger and stronger banks. Therefore the consolidation of financial institutions will be beneficial for the stability of the financial sector in the long-term and for the country. The Government has said the sector consolidation is desirable and beneficial. The committee appointed to review the implementation methodology proposed by the CBSL in 2015 whilst identifying the challenges, proposed the changes considered necessary to improve transparency and equity (to all stakeholders) in the process, in order to enhance the outcomes. Consolidation will no doubt enhance the size of the banks and rev up their ability to source oversees borrowing and risk taking capacity to enable private banks to participate in large State and private sector projects to a greater degree than at present and derive scale benefits with regard to operating costs and finally deliver greater value to all stakeholders. Financial sector consolidation is not a novel concept to the financial world; it is an approach that has been adopted by developed and developing economies alike, as a response to address weaknesses in the financial sector. Many of these countries have yielded the desired benefits, such as Malaysia and Singapore. Also for FDI and overseas borrowing to happen in large volumes and at competitive rates to fund some of the bigger projects, banks here would need to have the size, a good balance sheet and also a good business story which the foreign banks/investors are willing to accept and finally have stable dividend policies. Broadly, for banks to be future-ready, they would need to become bigger and stronger, put innovation to the spotlight, increase productivity, deliver great experiences across all customer touch points. On the other hand, the Government would need to deliver on their declared objectives before the next Parliamentary elections.